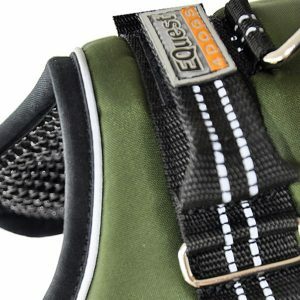 This Equest 4dogs harness has been made by a family factory in Germany. They know how to make dog owners happy. A perfect choice of materials. The outside has been made of sturdy polyprophyleen and the inside is made of nice, anti-slip, massaging latex. Superior fit and cut. The outside is equipped with robust, scratch-resistant polyprophyleen and is also moisture-resistant. 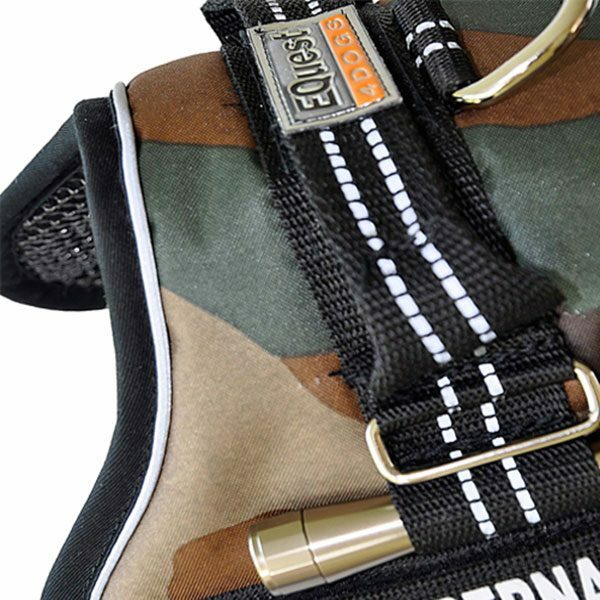 At the top of the harness is a sturdy D-ring to fasten the belt. There is also a handle on top of the rig to lift or grasp the dog. The chest strap is provided with velcro, so you can easily fasten. The belts have woven reflective stripes for a perfect view at night. The harness is adjustable with velcro. The waistband is also easy to change because of a slide. Both straps are provided with woven reflective stripes. The harness has also a reflection finishing touch. This is perfect for better visibility in the dark. Of course, the velcro on both sides is not missing, so you can attach velcro patches with name or funny texts. Because this colour will not be made anymore you can buy this harness at a bargain.